Iced green tea infused with ginger and rosemary is crisp, refreshing and perfect for any time of the year. 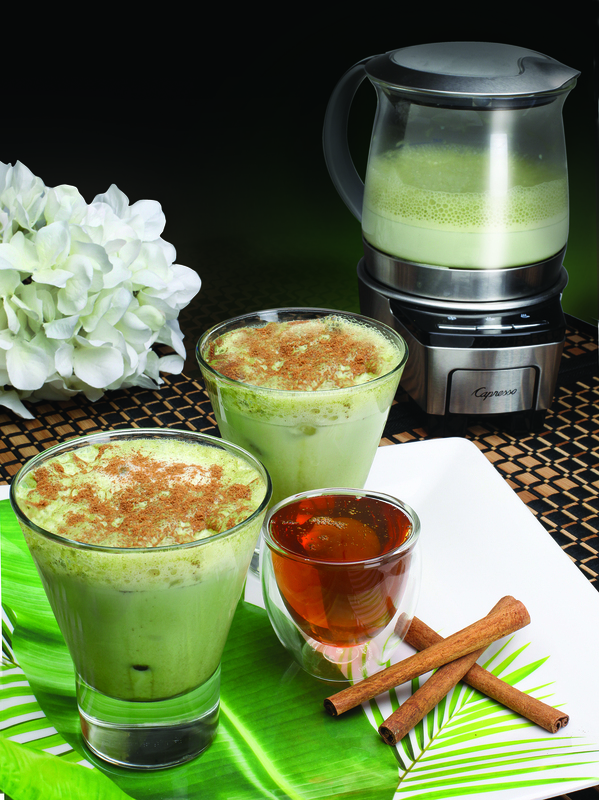 When you drink this soothing, healthful beverage, your body (and taste buds) will thank you! What are your go-to flavor combinations for iced tea? Add rosemary and ginger to your Iced Tea Maker pitcher, plus sweetener if desired. Fill pitcher with ice to the ice level marking and place pitcher with lid onto the machine. Place tea bags into the brew basket and close lid. Turn on machine and let brew. After brewing, pour tea into ice-filled glasses and garnish with extra rosemary, and enjoy! Since spring is in full swing, we’re using matcha powder (one of our new favorite ingredients) to create a refreshing cool treat. Matcha powder is an energy booster packed with antioxidants and nutrients, making this green frothy drink perfect for a simple pick-me-up that’s healthy and delicious. Place the frothing disk into the froth enhancer of your Capresso froth TEC and ensure it is securely snapped inside the bottom of the milk pitcher. Mix the milk and honey together, and add to the frothing pitcher. Place lid and press the Cold button. After two minutes, remove lid and slowly add the matcha powder and melon syrup. Replace lid and wait for frother to automatically shut off. Pour into iced filled glasses, and top with cinnamon enjoy! To find out about more Capresso products, visit www.Capresso.com. Clean the windows, organize the closet: these may be items on your spring-cleaning list. Much easier is cleaning your Capresso drip-coffee maker, espresso machine or electric water kettle, and you’ll enjoy the results every day with a fresher tasting brew. Capresso makes cleaning easy with Capresso Cleaning Solution. 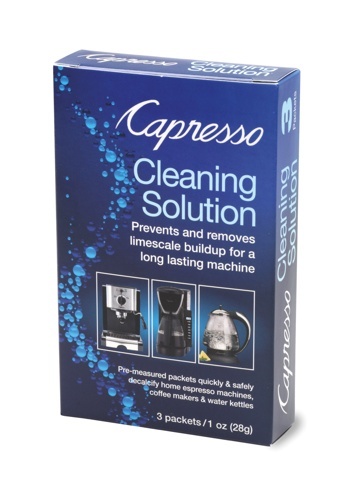 Specially designed for cleaning and descaling Capresso products, it prevents limescale and minerals from building up inside the brewing system or teakettle. It also helps remove hard water stains. Follow these simple steps and you’ll be on your way to ensuring your Capresso machine prepares its most flavorful cup of coffee, espresso or tea. For Espresso Machines: Dissolve 1 oz (28 g) of descaler with 32 oz (1 L) of water and pour mixture into water tank. Ensure portafilter is locked in place and a large receptacle is placed under the coffee spouts to catch the Cleaning Solution. Allow all water in water tank to pass through the machine by turning the dial to brew or pressing the brew button. You may have to do this multiple times to allow all the Cleaning Solution to go through the machine. Once all Cleaning Solution has been run through the machine, rinse all parts (water tank, portafilter). Repeat the cycle two more times with fresh, clean water to fully rinse the machine. For Coffee Makers: Dissolve 1 oz (28 g) of descaler with 32 oz (1 L) of water and pour mixture into water tank. Turn machine on to begin the brew cycle. Once brewing is complete and all Cleaning Solution has been run through the machine, rinse all parts (water tank, carafe, filter, filter holder). Repeat the cycle two more times with fresh, clean water to fully rinse the machine. For Water Kettles: Dissolve 1 oz (28 g) of descaler with 32 oz (1 L) of water and pour mixture into kettle. Allow mixture to sit inside the kettle for 20-30 minutes. Pour Cleaning Solution out and rinse the kettle 2-3 times with fresh, clean water. For more information, click visit www.capresso.com.